Every week is more challenging for each contestant of Jhalak Dikhlaja. Every contestant is trying hard to achieve Jhalak trophy. 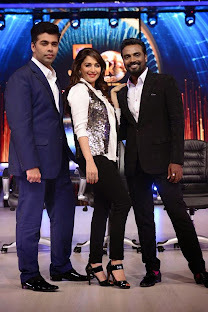 The show is full of entertainment including dance,fun, musti, dhamal ,the expressions of dancing diva Madhuri dixit, Karan Johar’s jugalbandi with Manish and Kapil, Remo D’souza’s shyness and specially comments, funny acts by Manish Paul and Kapil everything. Every week there comes celebrities to promote their upcoming shows/movies.Last weekend Priyanka made her appearance with Ram Charan Teja to promote her upcoming film “Zanjeer”. This weekend the famous bachelor of Bollywood is going make her appearance on Jhalak Dikhhla Jaa for promoting his upcoming controversial reality show “Bigg Boss Sath 7”. The show will be air on 15 September. Salman Khan will be in double role for Bigg Boss 7.One role will be angelic while another will represent his devil one. The contestants of Bigg boss have not been confirmed yet but there is news of Gauhar Khan as being a contestant of Bigg Boss. Last season Salman khan recreated the magic of Rajshri production’s Hum Aapke Hain Kaun with Madhuri Dixit.Now excited to see both of them again on Jhalak DikhlaJa 6.Surely there will be much more entertainment by Dabangg Khan and the dancing Legend Madhuri Dixit this time also. Yes, Big Boss has planned to come back with its brand new Season 7.The host of the show will be again the most handsome hunk & the most searchable celebrity online, Dabangg fame “Salman Khan”. This time Colors TV is going to telecast the great Indian reality show “Bigg Boss Season 7”. Bigg Boss is already become a famous reality show due to controversies, fights, game, politics & all. This Season 7 of Bigg Boss reality show will be full of more fun as Salman Khan will be in double role that means we will have double fun this time. There will be Salman’s two characters one is ‘angelic’ that is for good and other is ‘Devil’ which will be for bad. Salman Khan will be getting 5 crore per episode that means Salman will be whopping total 130 crore for Bigg Boss Season 7 which is just the double amount of last season as Salman Khan was getting 2.5 cr per episode in previous season “Bigg Boss Season 6”. By making this whopping amount Salman Khan has become the highest paid actor of Television . Dabangg Salman Khan is in controversy these days for his “Hit and Run Case” so why Salman Khan wants to finish the shooting for Big Boss till August as the trial of this case will begin in the mid of August’13. According to a source, Salman Khan has finalized the deal of big reality show “Bigg Boss” in INR 130 cr for total 26 episodes as he has to play double role that means double hardwork. Dabangg Khan has to play double role for the new season ‘7’ of Bigg Boss – One role will represent his angel look of ‘Heaven’ while another will be opposite the ”Devil of Hell”. This time this reality show is going to be more crazy and entertaining as well. This is the predictable Bigg Boss contestants list, it is not confirmed yet. But there is news that there may be one cricketer in the show. Although it is not sure that the cricketer will be only “ShreeSanth” But the chances of shree santh are because of his controversies during IPL. Bigg Boss is all set to make its comeback with bang of great contestants and new concept. Now we have only to wait till the show begins.